Bluff Europe is of course the first port of call if you want top notch coverage of this year's World Series of Poker. 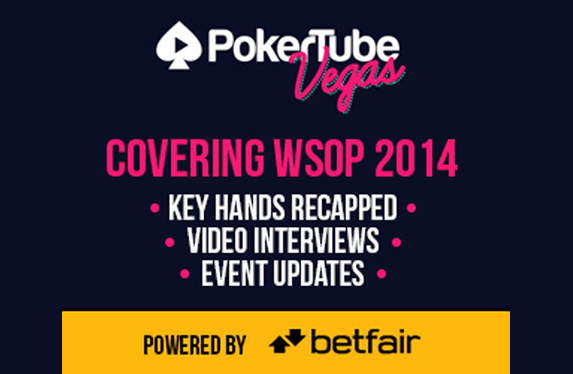 If you're looking for something to complement our daily reports then take a trip to PokerTube which has just announced details of its 2014 WSOP coverage. The new PokerTube Vegas channel will feature exclusive video content direct from the Rio with interviewers Laura Cornelius, Rikard Aberg and Natasha Sandhu (Mrs Sam Trickett to be) brandishing the microphone. "The aim of PokerTube Vegas is to offer poker fans the ultimate poker experience - if they can't make it to the WSOP itself we want them to have the next best thing," Jamie Nevin, 180Vita founder, said. "We will focus on why poker is such an exciting game to play, by providing original, exciting and authentic content, the likes of which you won't find anywhere else." In addition, PokerTube Vegas will provide real-time updates, coverage of key hands as well as following the fortunes of Team Betfair as the Series progresses.